We hate tea! Oh, wait. That's not what the thousands of people in downtown Spokane were protesting yesterday. They hate the government. Estimates range from 2,500 attendants to more than 5,000. 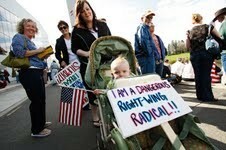 But, oddly, only one counter-demonstrator was spotted — and consequently "escorted" out by a throng of Tea Partiers. Deja vu Remember last week when some crazed driver hit a couple cars and a tree before coming to a stop against the wall of the Davenport Hotel? Well, last night Charchleen Hendrix drove her 1994 Nissan Sentra over a man (he's OK) and a parked car before colliding with the wall of Al's Motel on North Division. Drivers vs Cyclists In other bad-driving news, William Knight struck cyclist Theodore Chauvin on Cheney-Spangle Road last night. Chauvin went to the hospital with a broken leg and Knight, cops say, will face penalties. Show us your birth certificate, Mr. President! President Obama isn't American or Kenyan, but Martian. Yesterday, in a revamping of NASA's manned space program, Obama said he "expects to see" Mars in his lifetime. Phoning home, Mr. President? Iceland destroys European vacations In a move that shows Iceland's further loathing of Europe, an Icelandic volcano erupted recently, leading to the cancellation of 17,000 flights across Europe.